The ControlTL units are quite smartly designed. Made to be not too big and not too small, I find that they have a nice feel to them, stronger than some other camera triggers that come from, for example, the orient. The buttons are all easy to use even by people with large fingers. Both battery covers can be removed easily enough without any tools, using just a fingernail. 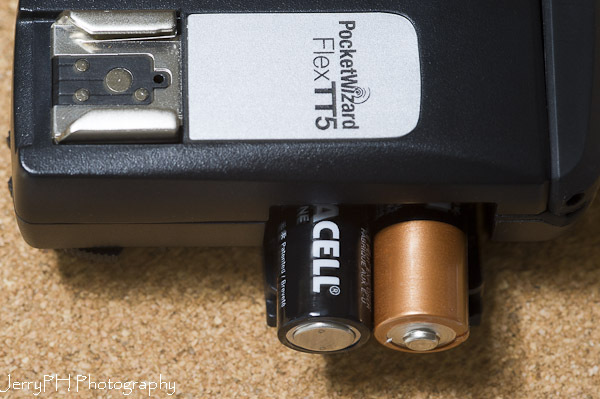 The FlexTT5, especially with the batteries installed, has a feeling of weight that a quality product has. I have seen a FlexTT5 hit a cement floor from a height of about 4-5 feet, and though it came apart at the battery door and bottom battery compartment cover, and sent the batteries across the room, the unit was surprisingly not damaged and after 5 minutes of playing with assembly, and re-installing the batteries, was as good as new, minus a couple scratches. The look of relief the owner had was nice to see, and I am sure an oriental until would not have survived the same fall with as little damage. 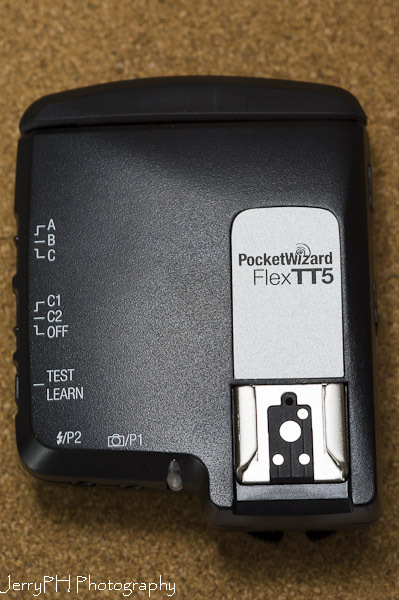 The FlexTT5 is a transceiver and can be used to trigger remote flashes when placed on camera, as well as used to receiver signals from a remote transmitter and set off flashes connected to either it's hot shoe or P2 port via a sync cable. 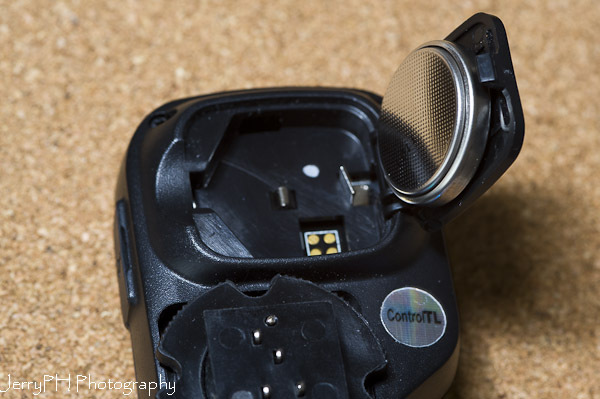 When set upon a camera, the hot shoe may contain a flash for front fill and/or a suitable commander such as a SB-700, SB-800, SB-900, SU-800 or Pocket Wizard's AC-3 to control the output of up to 3 groups of flashes. 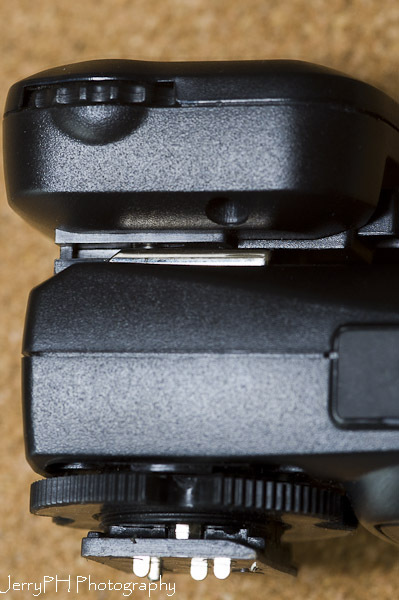 From the top, one can see the hotshoe where one can install the flash on to. On the left, we see the 3 main switches, the top most to set which of 3 possible zones the installed flash will be set to (A, B or C), the OFF/C2/C1 switch is the switch that turns on the unit to one of 2 preconfigured set of settings (C1 or C2). Under that is the Test/Learn button, used to do a test fire of the flash, do partial or full resets or complete learn procedures with. Above we have a better view of the 3 switches. On the rear side of the FlexTT5, we have the P1, P2 ports and the status LED. 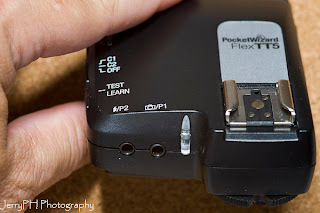 The P2 port is a 1/8th inch (or 3.5mm), mini-jack, used to connect the FlexTT5 to other flash units like older non-TTL flashes or studio heads. 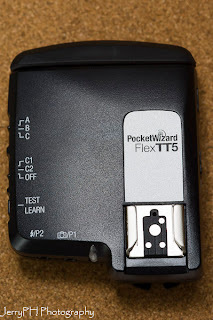 The P1 port is the same size as the P2 port, and is used to connect the FlexTT5 to your camera via a special cable and used for remote triggering of the camera (as opposed to remote triggering of flashes). 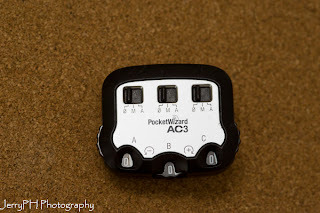 Both ports utilize a mono (not a stereo), plug. - it shows battery health status... green meaning good battery condition, yellow meaning a low battery condition is detected, change it very soon and red meaning that the battery is critically low and immediate change of batteries is demanded. At the front of the units is the antenna. When in use, it is always recommended to raise the antenna. Also, right behind the raised antenna, one can see the mini-USB port, to which one connects the supplied USB cable for firmware updates and new setting changes. 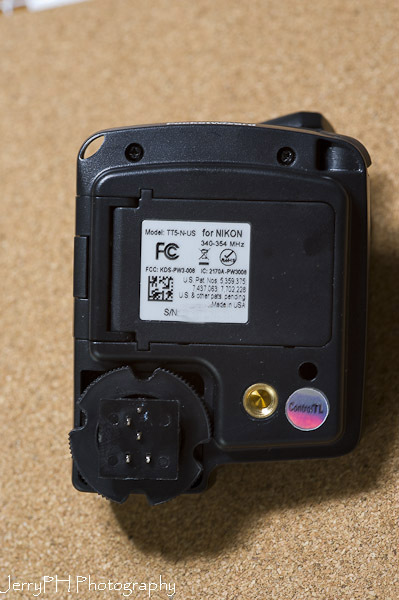 On the bottom of the FlexTTT5, we see the hot shoe connector, the 1/4-20 female socket and the sticker that identifies if the unit is for Canon or Nikon use and the serial number. On the right side of the unit is the door that opens to reveal the battery compartment. Please note that this is the proper orientation to install the "AA" sized batteries, which the unit needs to function. 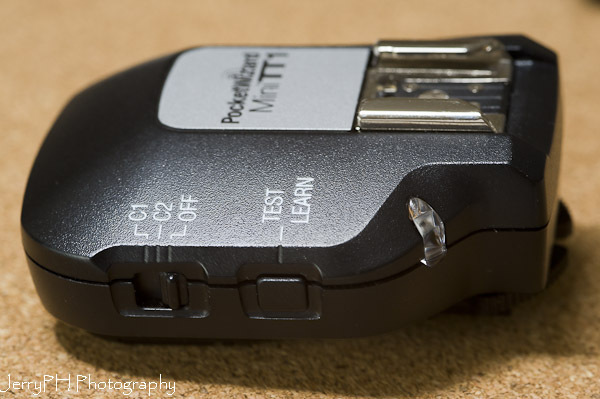 The MiniTT1 is a transmitter only, and has a smaller "footprint" than the FlexTT5, which is a transmitter/receiver, or "transceiver". 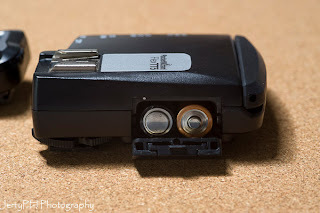 The MniTT1 has the antenna built into the unit and therefore has nothing sticking out f it. 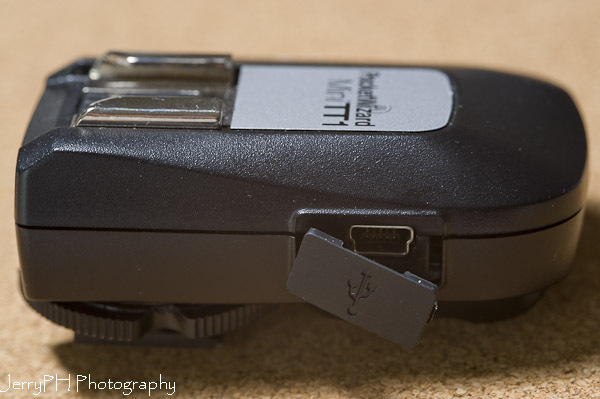 As you can see, it also has a hot shoe built in to the top of the unit. This is so that the hot shoe may contain a flash for front fill and/or a suitable commander such as a SB-700, SB-800, SB-900, SU-900 or Pocket Wizard's AC-3. Any of these units may control the output of up to 3 groups of flashes (excepton being the SB-700 which can control only 2 groups of flashes). The MiniTT1 has no P1 or P2 ports in it, so it cannot be used to trigger other flashes, nor can it be used as a remote trigger for your camera. It's sole function is a transmitter and receptacle for an on board flash or commander. The MiniTT1 does have 2 switches on it's side, the OFF/C1/C2 switch and a Test/Learn button and a status LCD. 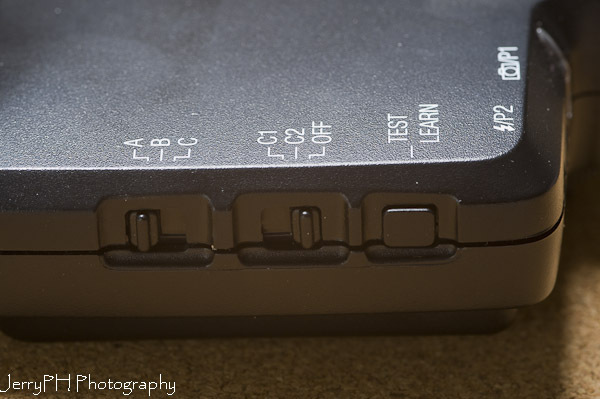 The OFF/C2/C1 switch is the switch that turns on the unit to one of 2 preconfigured set of settings (C1 or C2) and the Test/Learn button, used to do a test fire of the flash, do partial or full resets or complete learn procedures with. On the right side of the MiniTT1 is a small rubber door that hides the mini-USB port. 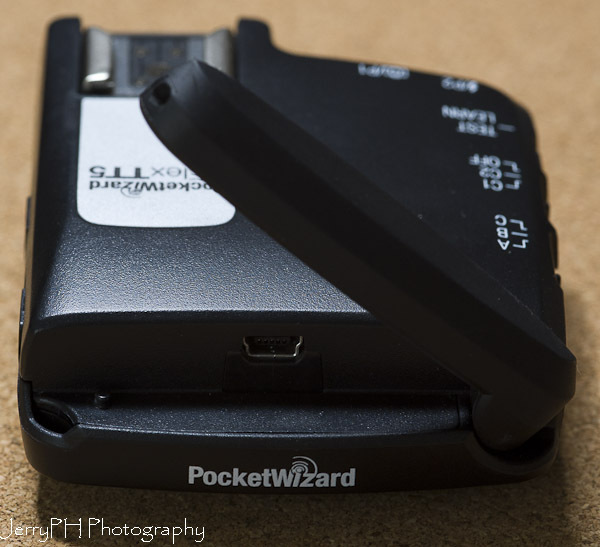 This is where you plug in the provided USB cable to update firmware or to make configuration changes. Underneath the MiniTT1 is the hot shoe connector and the battery door. 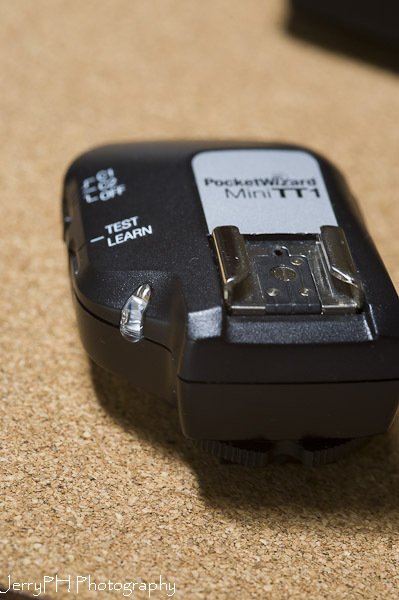 The MiniTT1 uses a CR-2450 coin style battery and the orientation is shown... for clarity, the POSITIVE side is always up and the NEGATIVE side is placed down. Right now you see the battery held to the lid of the MniTT1's battery door, because there is a small piece of sticky rubber used to press the battery securely on the battery connectors of the MiniTT1. The controls are split into 2 main areas, switches and rotary dials. Each is duplicated so as to be able to control 3 separate zones. The 3-position switch has the following settings: "0" or "zero" to turn off that zone entirely, "M" for manual power control settings. 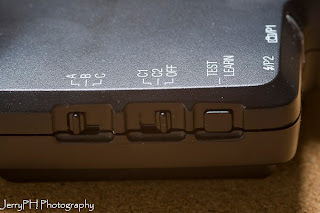 "A" is for automatic or TTL enabled control mode for that zone. The rotary dials lower or raise light output for that particular zone in 1/3rd of a stop increments. These dials work differently depending on if you are in "M" mode or "A" mode. We'll get more in depth with the AC3 in a future post. Next up: Let's talk batteries!